This is a discovery that is of immense importance to every child, every student, every teacher, and to every parent who has any concerns about their child doing well and living up to its true potential. Sad to say, in the current educational system, our educators are routinely violating these barriers and thus causing our children unnecessary difficulty in school. Put another way, certain routine current educational practices are themselves the barriers to the comprehension of what students are attempting to learn. It is not the students’ fault! The issue is not “dumb,” “inattentive,” “unmotivated,” “learning disabled” or “lazy” students. These are erroneous and unfortunate labels put on students by educators who, themselves have caused these apparent conditions or manifestations of student behavior, due to their not knowing there are seven barriers to comprehension and who, by their well-meaning though erroneous teaching practices, inflict these barriers to comprehension into the teaching activity. This we know, is a contentious statement and one that will earn a testy retort from some. But it is not the teachers’ fault either. They are generally a very committed and truly caring group. The “fault” lies with the fact that these seven barriers to comprehension had not been discovered and made known till now, and it is an omitted piece of knowledge within our educational establishment. So, what are these magic silver bullets for student success? 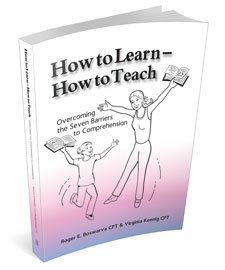 In our book How to Learn—How to Teach: Overcoming the Seven Barriers to Comprehension we go into these seven subjects in depth. There is a chapter devoted to each barrier. Plus, there are also a number of exercises for you to do so you get a full and clear understanding of each barrier. You learn how to recognize them—yes, there are easy ways to recognize when one has occurred on you or you have inflicted one on your child or student. And we teach you what they are and how to handle them. Don’t make these mistakes when home-schooling your child!